← Mr. O.A. Hameed, former A.C, on the Validation Clause! The ESIC was intended to provide not only medical care in a better manner but also financial security in cases of sickness and in certain other contingencies. While formulating the ESI Scheme, Prof. B.P. 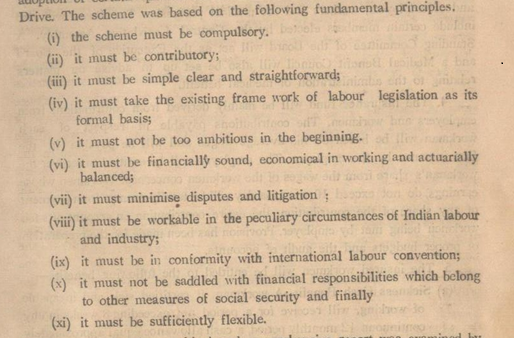 Adarkar had, very thoughtfully, specified eleven Fundamental Principles. They are, in fact, sound directive principles to be kept in view by the Government not only for any social security measure to be introduced through the ESI Scheme but also on any labour-welfare related matter. The one of his Fundamental Principles is that the proposed scheme “must not be too ambitious in the beginning”. Is it necessary for the ESIC to open and run Medical Colleges? Should those colleges be for post-graduate courses only or for under-graduate courses too? How many colleges must be opened and run by the ESIC? What would be the cost and what could be the benefit? But, the very proposal to start more than 20 medical colleges throughout India at a stretch, at the initial stage itself, showed that this basic fundamental principle itself was violated. Dr. R. Govindaraju, former State Medical Commissioner, Pudhuchery says, “Converting ESIC Hospitals to Medical Colleges is a heroic deed. But these things should be taken, in a phased manner. First one hospital should be converted into a Medical college.It should run for few years. Then top officials of ESIC, both medical and non-medical, should analyze the performance and if it is found to be useful for the ESI patients, this project can extended to other ESIC Hospitals”. Mr. P.Gurusamy, former Joint Director, has this to say: “Large number of resolutions have been passed by the ESIC till the year 2008 opposing to start medical colleges on the ground that our I.Ps can’t be used as ‘Guinea Pigs’ and the funds can’t be diverted from the core function of delivery of benefits. Long back in one of the ESIC meetings held at Pune, the then Labour Minister, Mr. Khadilkar was able to get a resolution passed in favour of a starting s medical college at Pune. But, the proposal was scuttled down by the Law ministry. …”. Were the earlier reports referred to by Mr. Gurusamy examined and the earlier findings rejected by assigning proper reasons? Is it not a basic administrative procedure to refer to the previous papers before modifying the stand of the administration on the issue of opening Medical Colleges, a crucial issue involving huge expenditure with no income from that source? But, it was not done. On the other hand, buildings were immediately permitted to be constructed. Huge outlay was allocated. Projects involving thousands of crores of expenditure were cleared in a single financial year. These projects were for construction of medical colleges and also for modernization of the regional offices without any request from any region, through the Regional Boards, for such modernization. Deans and Professors were appointed, in violation of the laid-down procedure. No recruitment regulations! How were these actions to be regularized? What will happen if the Parliament does not accept the proposal for opening medical colleges, specially when the expenditure of thousands of crores had already been incurred? It, therefore, became essential to ensure that the ESI Act was got amended by Parliament to suit regularization of various actions taken already in the area of construction of buildings for medical colleges and appointment of faculty. The appointment of consultants and specialists. Setting up of medical colleges. These questions were so specific and correct that they could not be replied to. But, the situation was so desperate that the amendments proposed on these two counts should necessarily be got passed, and that too, retrospectively, as, otherwise, the huge expenditure already incurred would not be regularized. What, then, was the option open? There came handy the tips from Sir Humphrey of “Yes, Minister” in which Bernard, (junior bureaucrat) the PPS, providing secretarial assistance to the Minister, confesses to his senior bureaucrat that he is worried about keeping the Minister in the dark. But, the Permanent Secretary Sir Humphrey (senior bureaucrat) convinces him and encourages him to manage the Minister and explains that it is necessary to keep Ministers in dark . “It is up to the civil service to decide which proposals are put before the Minister, and then “guide” him to its favoured option, in much the same manner as a conjurer “forces” a card to be chosen”. In the case of ESI (Amendment) Act, 2010, the bureaucracy managed not just the Minister but the Parliamentary Committee and the Parliament. The amendments did not define the terms ‘Consultants’ or ‘Specialists’. There was no reference about the “super-speciality services” in the actual amendment proposed. In that nebulous situation, the Notefiles used the term consultant when the intention was to discuss about specialists. Consultants were appointed not only in medical field but also in various other fields. All got regularized? ! The amendment proposed was then approved by the Committee of Secretaries. That was how bureaucracy dealt with bureaucracy. Later, the matter was examined by the Parliamentary Standing Committee of Labour. The Parliamentary Committee found that the ESIC had adopted the same pay scales as followed in the AIIMS. When AIIMS did not have difficulty in getting specialists, how did the ESIC have problems? The Committee thought that the ESIC had not made proper efforts to appoint specialists in the manner in which the AIIMS was doing. So, the Committee advised the ESIC to make “concerted efforts” to recruit consultants on regular basis and not on temporary basis “before opting to engage Consultants on market rate of compensation. The Committee, therefore, recommend that a fresh assessment should be made in respect of the availability of Specialists on revised attractive pay scales before any proposal for engagement of Specialists on market rates is considered”. In effect, the Parliamentary Committee did not approve the proposal to amend Sec. 17 but wanted fresh assessment on availability of specialists “before” any proposal is considered by it. Yet, the amendment came through. How bureaucracy dealt with the Legislature in this regard are given in detail in the Post ‘Amendment 2010: the Enigma – Episode 1’. In regard to Medical Colleges, the Parliamentary Committee asked the Ministry of Labour / ESIC to give a detailed account of vacancies vis-à-vis recruitment of medical and para-medical staff done during each of the last five years. Apparently, the PSC wanted to know whether it was really necessary to set up medical colleges and nursing colleges to appoint doctors and nurses in the ESI Corporation. The PSC, therefore, sought information whether these people were not available in the market to the extent of the requirement of the ESIC. The PSC, therefore, specifically wanted the information about the details of recruitment action taken by the ESIC. If the reply contained the fact regarding the response to every advertisement for appointment of GDMOs and Nurses, the Committee would have arrived at the right decision. Because, whenever applications were called for, there were overwhelming responses with thousands of applications for the post of GDMOs and Nurses. It required strenuous efforts on the part of the ESIC even to conduct the examinations, because of large number of applications received from the candidates. But, this fact was not told. The Parliamentary Standing Committee was misled. Complete details as available on record are given in the presentation on Medical Colleges under the Post “No time to read: so, ESIC got Medical Colleges”. Prof. Adarkar: Was he heard? Prof. Adarkar submitted his report to the Government of India on 15.8.1944. But, the fundamental principles mentioned by him to make a modest beginning and not be too ambitious at the initial stage itself was lost sight of 64 years later. The ‘Action first: Law next’ concept created a desperate situation to get the Law passed somehow. The place in which the Validation Clause was inserted in the combined Bill shows the cleverness of the bureaucrats of the Ministry of Law, who actively participated in the process of this law-making. To cap it all, the Ministry of Law was not ready to have a re-look into the issue even when the serious implications of the amendments had been taken to its notice by various persons in the year 2009. Was there any collusion? Moreover, what about the promise given by the Cabinet Secretary to frame Rules for determining the market rate for engagement of Consultants or Specialists? Will these Rules also be enacted with retrospective effect? Otherwise, how was the expenditure incurred towards payment of fee or remuneration or salary paid to the consultants and specialists all these years going to be regularized? We invite people who are in the know of things to enlighten the public! ESIC had been misleading the IPs and the Government for a long time now. They should have got specialists and regular doctors as faculties a long time back. They did not. So, the patients suffered. Mainly (uPTO 95%) the ESIC benefits to the IPs is in form of medical care. Rest insurance and sickness funds are secondary. The Govt of India should have taken this initiative a long time back. Else those in office bearing positions never care about health of IPs. They want medical graduates to treat the patients and keep specialists at bay for personal unethical motives. ESIC shold be taken directly under the govt, and our funds utilised in a correct manner for recruiting good doctors and specialists and colleges and hospitals is a way to start. esic should stop running medical colleges.students should be immediately shifted to other recognised colleges.esic should neither be handed over to state nor be run in ppp [public private partner ship] mode.BJP should not surpass congress in causing social insecurity.Modi should keep up his promise.He should not fall prey to the corporate giants.